The Weird Soda Review Lab is not only dedicated to discovering Weird beverages; we also enjoy Weird movies and TV. Recently, Olorin and the Kibbitzer-in-Chief have been making their way through Buffy the Vampire Slayer, Joss Whedon's magnificent multi-season epic. Seeing them watching an episode recently reminded me that I had several bottles of Buffy-themed sodas from Jones Soda, makers of all sorts of strange drinks. We should get to those! I had never noticed that Giles wasn't on the Buffy Season 3 box. Well, now I can take care of that. Where and when: Ordered from Amazon (I think) a while ago. Scent: Faint, popsicle-y grape. Fairly tart, pleasant, synthetic. Reminiscent of Welch's grape soda from my poolside childhood days. Taste: Unremarkable but nice. Not a very strong taste. More tart than sweet, synthetic grape, and that's about it. Really, this is only Weird from the label. Now, if you've watched Buffy, you know that Giles is a noble, courageous, and brilliant man, who is nevertheless not exactly the life of the party. We love him, we admire him, and we would probably avoid trying to do karaoke with him. This is a well-named soda. Afterburp: A tiny bit more interesting, with more volatile flavors evident. That's kind of a disgusting thing to write. Quaff rating: 2.5. Just not very interesting, and I don't feel like a stevedore. EDIT, LATER: It is probably worth noting that I am now in big trouble with the Kibbitzer-in-Chief, who is very upset that I implied that Giles was boring and fake. For the record, please let me clarify: I think Giles is terrific, and did not mean to imply that he was insincere or dishonest. I'm sure that a scholarly discussion with him would be very stimulating. However, he doesn't make me sit up and go "wow!". Buffy's mother might have a different opinion, of course. If she offers to do a review, I'll post it. Once again, the Lab is facing a backlog of soda. What can we say? There are other pressures* even on the life of a Quaffmaster, and though braving the heights and depths of Weird sodadom and penning epistles for you who seek the vicarious experience of imbibing is my deepest calling, I cannot utterly ignore all other demands for my time**. Thus, as though a Mentos had been dropped in the Diet Coke of the life of the Lab, we must attempt to relieve the growing pressure of Weirdness before it explodes into a sticky flood of bubbly broubaha***. Fortunately, I have high hopes that today's item will be a pleasant experience. Belvoir Elderflower, here depicted next to actual elderflowers. It's kind of like a family portrait. 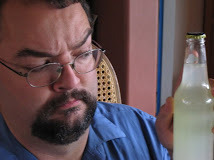 We've reviewed one other elderflower soda--Sweet Blossom Elderflower. It was fantastic, and still ranks amongst my favorite Weird sodas of all time. Good science practice, however, demands that we assess other elderflower beverages to determine whether the exquisite flavor of the Sweet Blossom was due to the presence of elderflower, or some other unidentified factor. I'm not actually sure what a "pressé" is. My mind, of course, imagines elderflowers being picked, arranged on some sort of sluice, and smacked Muppahone-like with mallets****. This is admittedly unlikely. Let's see if the bottle label holds any clues. First, the label appears to be real paper; it's thin, and wrinkly where moisture has caused it to peel a bit. On the back, it becomes clear that this is from England, and it claims to contain fresh, hand-picked elderflowers. Seeing none floating in the bottle, I have to assume that it is more like a tea made from said elderflowers (although I note that a Muppaphone-type apparatus is not ruled out; it would presumably have an English accent). The ingredients list includes only water, sugar, elderflowers, and lemon juice. Spiffy! Bonus points: the little drawing of elderflowers on the label is pretty realistic. Where and when: To be honest, I can't remember. Color: Transparent, slightly yellow tinge. Scent: Flowery, slightly tart, sweet. A bit like a very sweet, milder lavender. Pleasant. Olorin: "Kind of like honeysuckle pear-y lemon." Taste: Much more sour than the smell; the lemon juice is prominent, but not unpleasant. The sweet, flowery smell is very pleasant in the taste. It's quite strong; this is potent stuff, much more so than the sedate label would suggest. Really, the overwrought labels and names of American sodas (e.g. the various "EXTREME!" Mountain Dew variants) would be better applied here, as this has more of a bold, strong taste than most of those. However, given that it's a British label, it'd have to be different. Olorin: "Kind of the flavor of lemon juice, but with the flavor of pear. Leaves a dry-ish texture in the back of your mouth, like not quite ripe fruit." This is getting decidedly unimpressed responses from the rest of the Lab. As for me, I like it well enough, and I admire the boldness of the flavor...but the Sweet Blossom was much nicer. This lacks the pleasant fruit flavors, and substitutes a very strong lemon. It's much like a slightly bubbly floral British lemonade. Cough rating: 0.5. The lemon, while not unpleasant, it very strong. * For example, recently reinstalling Diablo 2, because...well, because. ** Some of those Unique items are really hard to find. *** A.k.a. the Kibbitzer-in-Chief giving me that look.